A few eyebrows were raised when Liverpool signed Andy Robertson from relegated Hull City in the summer. The Reds paid £8 million for the Scottish left-back with Kevin Stewart going the other way. Robertson had not been able to prevent the Tigers from going down last season and it was his second relegation from the Premier League in three years. Anyone who has watched Hull City over recent years would have known what a talent Robertson is. His crossing ability and willingness to get forward and join attacks has been evident since he first moved to the Premier League in July 2014. Hull signed him for just £2.85 million from Scottish side Dundee United. It may seem that he has come out of nowhere and into Liverpool's plans. 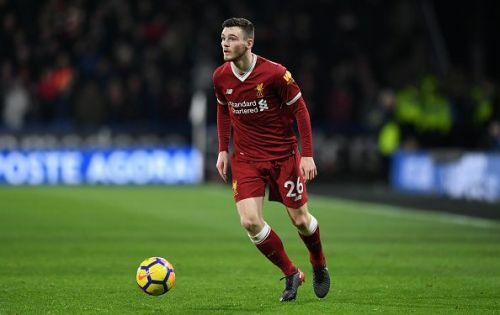 However, Robertson has been impressing quietly in the Premier League and his success at Liverpool will not come as a surprise to Hull City fans. Robertson, who is now an established Scotland international with 20 caps to date, started his career with Scottish Third Division side Queen's Park. He had played for Celtic as a youngster but was released at U15 level for being too small. He was in fact about to start an undergraduate degree at University but scrapped the plans after signing for Queen's Park. The Scottish minnows play their home games at Hampden Park and it did not take long for Robertson to make a name for himself in the Scottish lower leagues. He impressed in his only season with Queen's Park in 2012/13 and was snapped up by Scottish Premier League outfit Dundee United in July 2013. Robertson was immediately part of their first-team and won the PFA Scotland Young Player of the Year award as well as being named in the PFA Scotland Team of the Year for the 2013/14 season. He helped them get to the Scottish Cup final but they, unfortunately, lost in the final to St. Johnstone. He was then signed by Premier League side Hull City in that summer. His rise from the lower leagues in Scotland to the English top flight was nothing sort of remarkable. Robertson could not prevent Hull City from being relegated in a tough first season at the club. However, he was pivotal for their then manager, Steve Bruce, in their promotion campaign from the Championship in 2015/16. Then after promotion Bruce left and off-the-field problems affected the Tigers and they ultimately went down again. Hence why Liverpool were able to sign him in the summer and they have not looked back since. The £8 million fee they paid for him now looks like a real steal after Robertson has established himself in the first-team. He has become a hit with the Liverpool fans and many expect him to have some successful years ahead at Anfield.